Readers could accept Enrico Caruso as a detective once, just for the fun of the story. But I didn't think I could get away with it a second time. So I talked it over with Tom Dunne, my editor at St. Martin's, and suggested using the same setting and recurring characters but having a different singer act as detective in the next book. 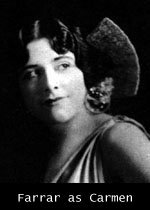 This time out it was to be soprano Geraldine Farrar. Farrar was a wonder. She didn't have the greatest voice in that pantheon of great voices, but her musicianship was superb. What's more, she was daring and adventurous, never afraid to try new things. In short, she would make a perfect detective. Farrar was beautiful and stylish as well; she had a devoted contingent of fans, young women in their late teens and early twenties who were known as Gerryflappers. Having your own army of Gerryflappers could be very handy to an amateur detective. It's a truism in publishing that the middle book of a trilogy is always the weakest, as it serves as a bridge between two end points. But not in this case. According to just about everybody's opinion, including my own, Prima Donna at Large is the best of the three opera mysteries. It didn't start out that way. I wrote about seventy pages and then stopped. It was...okay. But it didn't sing! And when you're writing about opera, your book had dang well better sing. I'd started off writing in the third person, the same point of view I'd used in A Cadenza for Caruso; but then I thought about switching to first-person narrative, letting Farrar tell the story herself. I hadn't gone more than two pages before I knew I had the right voice. The story takes place in 1915, during a tense time when America had not yet joined in on World War I. The Met snaps up a renowned French baritone who is fleeing the struggle in Europe; but the baritone proceeds to make enemies of everyone with whom he comes in contact. Eventually, one of his enemies eliminates him. Caruso, warned by the police not to meddle this time, talks Farrar into investigating. She's reluctant at first...but once she gets going, she's unstoppable. A rather wonderful thing happened right after this book was first published. I started receiving letters from quite elderly women. One was in her nineties and had to get her niece to write for her. So who were all these old ladies who were suddenly writing to me? They were the Gerryflappers. My book had taken them back to an exciting time in their lives, and they wanted to let me know that. And they all had stories to tell. "I was there the night Farrar and Caruso got into a fight during the last act of Carmen" and "I couldn't believe my eyes when Gerry dropped her blouse in Zaza," and so on. All these reminiscences, from women who'd actually been a part of it. "To anyone who is a mystery buff as well as an aficionado of Grand Opera during the Golden Age of the Met, Barbara Paul's Prima Donna at Large will prove to be one of the funniest, most outrageous, and ingenious whodunits to come their way." "Farrar as a detective is a delightful creation. Although she seems to be, at first glance, a typical prima donna -- concerned only with prestige, roles, and being front-stage-center -- she becomes in Paul's hand an intrepid and insightful woman who ultimately cuts the Gordian knot of the investigation to confront the killer. Delicious! A must for opera buffs and whodunit fans alike." "Prima Donna at Large is an unusually pleasant divertissement. Mrs. Paul has really done her homework. And if you think the portrait of Farrar is exaggerated, it isn't. She was exactly as she is depicted here." "Paul is among the handful of writers who consistently turn out well- researched, thoroughly absorbing novels....Delightful soprano Geraldine Farrar provides the lively detective work, and behind-the-scenes operatic vignettes add humor and spice." 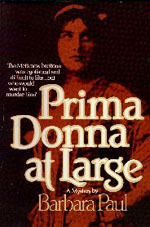 "Prima Donna at Large is a combination of genuinely funny humor, characters so real you can't tell which are fictional, and a well-plotted mystery. And it brings back memories of a bygone age."